30 Teams, 30 Posts (2016): What is Raymond? In 30 Teams, 30 Posts, I write a post (of varying amounts of seriousness) about every MLB team in some way in the lead-up to the beginning of the 2016 season. Earlier installments can be found here. 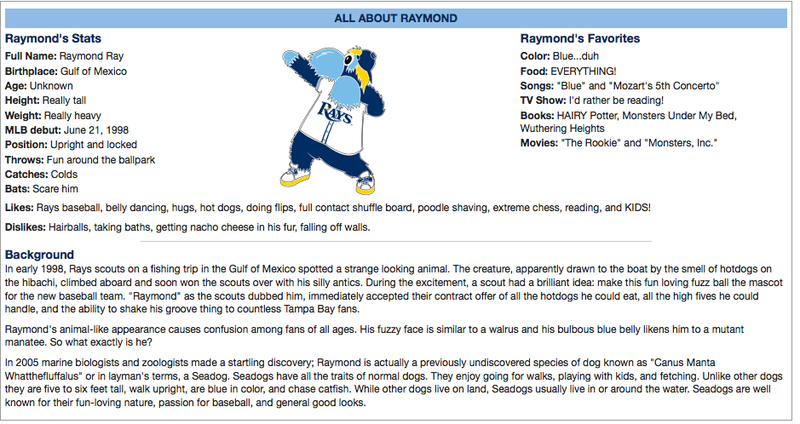 Today, I reveal the truth about one of the AL East’s mascots- Raymond of the Tampa Bay Rays. 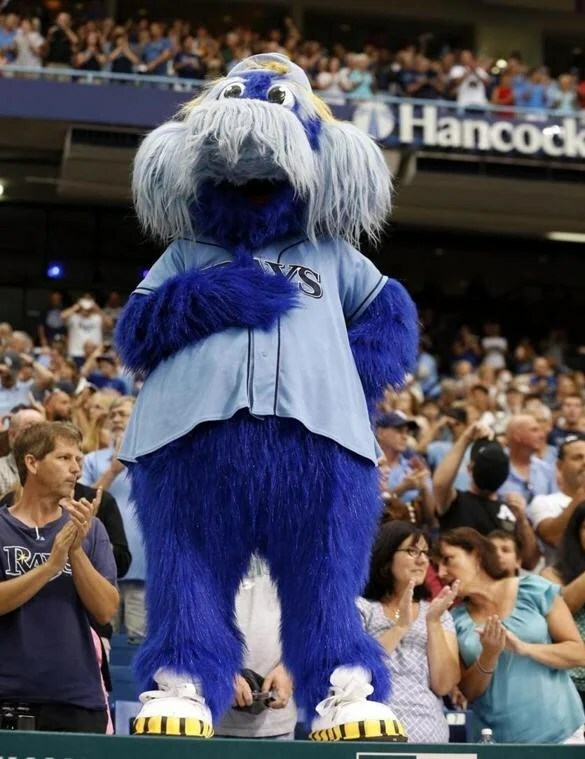 You may be thinking that, given the fact that he is the mascot for the Rays, that he would be a Ray. You would be wrong. It turns out that he is NOT a Ray. Do you see the relevant thing, here? Yes, he is, apparently, a “seadog”. However, according to Wikipedia, there is no such thing as a seadog. Oh, it’s a slang term for seals, or for people (or dogs) that spend a lot of time at sea, but there is no such thing as a sea dog. Nothing of the species Canus Manta Whatthefluffalus. In fact, there isn’t even a genis called Canus. There is, obviously, Canis, which is where dogs are, but Canus (Latin for “aging”) does not. So, what is it, Tampa? What is Raymond? What scientists truly discovered him? Could he be… (GASP) a mere man in a suit!?!?! Tell us the truth, Tampa. We know you are hiding something. This entry was posted in Baseball, MLB, Uncategorized and tagged 2016, 30 Posts, 30 Teams, 30 Teams 30 Posts, AL, baseball, Major League Baseball, mascot, MLB, Raymond, Rays, Tampa, Tampa Bay, Tampa Bay Rays by danglickman. Bookmark the permalink.